Archeological excavations on Wallis have uncovered traces of civilization dating back to 1400 B.C. Fragments of lapita pottery found at the site indicate that the first arrivals were Austronesian. During the 15th century A.D., Tonga undertook a program of expansion in the South Pacific. The ruthless warriors of Tu'i Tonga conquered the south of Uvea in about 1450, after battles which have become legendary. Although the island later obtained its independence from Tonga, descendants of the Tu'i Tonga formed the nobility of the country, under a chiefly title system which became fully established by the 17th century. The island was named after an English navigator, Captain Samuel Wallis, who discovered it while sailing the HMS Dolphin on August 16, 1767, following his discovery of Tahiti. He in fact dropped anchor off the Uvea coast before continuing on to the northeast. Following this brief visit, the island had little contact with Europeans until the 1820s. Early historical accounts of Futuna and Alofi are not as well documented. 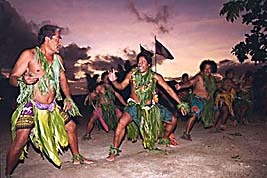 It is thought that the first settlers came from Samoa, but tradition also mentions other contacts, possibly with Marshallese Islanders or Tongans. The first European record of the islands dates back to 1616, when they were discovered by the two Dutch navigators Willem Cornelius van Schouten and Jacob le Maire, who named them the Hoorn Islands (after a town in Holland). Starting around 1825, numerous whaling and merchant vessels plied these waters; frequently, their ships would call at Wallis to take on fresh supplies. In 1837, the first Marist missionaries arrived, among whom was Father Bataillon (Wallis Island) and Father Chanel (Futuna Island). As a result of their ministries, the entire population had been converted to Roman Catholicism by 1842. The missionaries played an important role in local society, protecting the inhabitants from abuse or exploitation by the whalers and merchants. They also instituted laws applicable to the entire population, such as the "Offisa" (Wallisian constitution of 1863). On April 5, 1842, authorities in Wallis requested French protection, which was granted. In 1886, Queen Amelia of Wallis signed a protectorate treaty which was officially ratified by the French government in April 1887. In September of the same year, the kings of Futuna also requested French protection, and this request was accepted. The Ministry for the Colonies gave the two island groups a common entity under the name "Protectorate of the Wallis and Futuna Islands", which was attached to New Caledonia for administrative purposes. It was not until 1931, however, that a maritime connection was established with New Caledonia and that the French currency became legal tender. (2.) "Jeune fille des Îles Wallis et Futuna"
© 1996-2000 Namo Interactive Inc.
During the Second World War (May 1942), a regiment of U. S. Marines arrived in the archipelago to deny the islands to the Japanese, followed by a number of Free French forces some months later. The Allies thus established a strategic air base here, with up to 6,000 soldiers present at any given time. As a result, military infrastructure was spread across the island. This period led a to a change in customs, with a number of the local population employed by the Americans attracted by the dollar. Unfortunately, when the Americans left at the end of the war, much of their military machinery was dumped into the volcanic crater lakes. Wallis and Futuna became a French Overseas Territory in 1961, following a referendum held on December 27, 1959. Beginning in the 1950s, for economic and demographic reasons, many inhabitants of Wallis and Futuna were attracted to the plantations and mines of New Caledonia and the New Hebrides (rebaptised Vanuatu). Consequently, there is a community of Wallisians and Futunans living in Noumea and throughout the Caledonian territory, consisting of approximately 17,000 ex-pats. However, recent legislation introduced in New Caledonia favoring local employment may jeopardize this arrangement. As an overseas territory of France, Wallis and Futuna depends upon the French Constitution and the French legal system (including special adjustments) for its operation. Chief of State: President François Hollande (since 6 May 2012). Head of Government: Michel Jeanjean was appointed the French Administrator Superior of Wallis and Futuna on 10 June 2010, succeeding his predecessor Philippe Paolantoni. He provides the functions of Head of Territory and represents the République on the Islands. Cabinet: A Council of the Territory consists of 3 kings and 3 members appointed by the High Administrator on advice of the Territorial Assembly. Its role is to assist the Head of the government in the management of local affairs. Wallis and Futuna is the only French territory where a native system of monarchy has been allowed to survive. There are three traditional kings in Wallis and Futuna: the Lavelua (King of Wallis), the Tuiagaifo (King of Alo) and the Keletaona (the title of King of Sigave depends on family heritage, thus he carries the title of Tui Sigave, Tamolevai, or Keletaona). Territorial Assembly: 20 seats; members elected by popular vote to serve five-year terms; elections last held in April 2012. President of the Territorial Assembly: Vetelino Nau (since 4 April 2012), member of the Socialist Party. Vice-President: Mikaele Kulimoetoke. French National Assembly: elections last held 17 June 2012. Deputy: Mr. David Vergé, of the UMP Party (l'Union pour un mouvement populaire). French Senate: elections last held 21 September 2008. Senator: Mr. Robert Laufoaulu (since 27 September 1998; re-elected 2008), of the UMP Party. Justice is generally administered under French laws by the Chief Administrator, but the local chiefs or kings administer customary law and there is a magistrate in Mata-Utu. Sources: 2001 Grolier Multimedia Encyclopedia, ©2000 Grolier Interactive Inc.; Wallis and Futuna, official web site of the Islands; the Embassy of France in Australia; the UNEP World Conservation Monitoring Centre, providing information for policy and action to conserve the living world; the French National Assembly; and the French Senate.  All Rights Reserved. Relevant publications: David Stanley, Moon Handbooks: South Pacific, 7th Edition (2000). Errol Hunt and Tony Wheeler, Lonely Planet South Pacific - Travel Survival Kit (2000). Robert Aldrich, The French Presence in the South Pacific, 1842-1940 (1990) and France and the South Pacific Since 1940 (1994). Frank Sherry, Pacific Passions: The European Struggle for Power in the Great Ocean in the Age of Exploration (2000). International Business Publications USA, Wallis and Futuna Investment & Business Guide (2002). International Business Publications USA, Wallis and Futuna Business Law Handbook (2002). The Wallis & Futuna Research Group, A Strategic Profile of Wallis and Futuna, 2000 edition. International Business Publications USA, Wallis and Futuna Country Study Guide (2002). Nelles Maps, Nelles South Pacific Islands Travel Map (2002). Kim Gravelle, Romancing the Islands: Journeys in the South Pacific (1997). Images: Map of Wallis and Futuna © Lonely Planet  All Rights Reserved. Maps of Pacific Ocean and Wallis Island © Discover France  All Rights Reserved. Photos: Dancers On Futuna and Aerial View of Wallis, © Pascal Nicomette, Photographer  All Rights Reserved (CD-ROM of images available from the photographer). 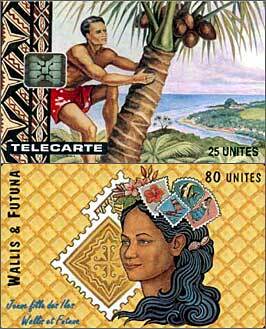 Télécartes (pre-paid phone cards), from Le Serveur Internet de Wallis et Futuna © 1996-2000 Namo Interactive Inc.  All Rights Reserved. Air Calédonie offers two flights weeky  on Tuesdays and Saturdays  to Wallis from Noumea (New Caledonia  NC); the Saturday flight also travels to Futuna. Through the Discover France Travel Center, you can book flights to Noumea, NC from major hubs everywhere. Most flights originating in the U.S. (any airline) will connect to Qantas, flying from Los Angeles (California) to Sydney (Australia), then via Air Calédonie to Noumea. U.K. travelers will depart London Heathrow via Scandinavian SAS to Tokyo (via Copenhagen), then connect on Air France to Noumea. Flights between the islands can be booked directly from the Aircalin (Air Calédonie International) web site. Visitors to Wallis & Futuna will find cozy accommodations at Hôtel l'Albatros, situated near the airport on Wallis. Since it has only 3 bungalows and 4 single rooms which are frequently booked by business travelers, advance reservations are advised. Contact the hotel directly via phone or fax (681 72 18 27 ), or write for more information to Hôtel l'Albatros, BP 421, Uvea 98600, Wallis. Is this a good time to call someone in Wallis & Futuna? Find out by checking the correct local time in the capital, Mata-Utu. The Federal Consumer Information Center offers information on passport and visa requirements for Wallis & Futuna, as well as other French Pacific islands. The Flags of the World site offers a collection of Wallis & Futuna flags, including various standards representing the Kingdom of Uvea (Wallis), along with historical commentary. According to the Ethnologue, East Futuna and Wallisian are the two common languages spoken in Wallis & Futuna  both of Malayo-Polynesian derivation. Despite being the official language, French is spoken by only 7% of the total population  usually those in government. The national literacy rate averages 95%. Part of the Perry-Castañeda Library Map Collection at The University of Texas in Austin, this site presents a large collection of political, geographic, and other maps of Oceania, the Pacific Ocean, and West Pacific Islands. The non-profit, human-compiled database provides useful links about Wallis & Futuna, in both English and French. Serious collectors and casual aficionados alike will appreciate this artistic collection of télécartes (pre-paid phone cards) dating between 1992-1999, which depict colorful scenes of island life. Professional photographer Pascal Nicomette displays dozens of sumptuous photographs of the islands, which may also be acquired on two CD-ROMs. Doris is an antenna relay system which transmits meteorological measurements (humidity, barometric pressure, temperature) from remote locations around the world. This page shows a picture of the installation at Futuna, and details the equipment's technical specifications. This page provides annotated observations of the terrestrial and maritime ecosystems for the three islands of Alofi (uninhabited), Futuna (Hoorn), and Uvea. Includes endemic species of conservation interest. Listen to live Wallis Radio (QuickTime plug-in required), discover maps and photos, explore the history and geography, or read the news of the islands. The Weather Underground provides a week's forecasts for the Hihifo district of Wallis (including the capital Mata-Utu), plus astronomical observations and weather-related photos. Wallis and Futuna's team took the gold in the 1000-meter 6-man rowing competition of the Xth World Sprints Va'a Championship, held March 9-15, 2002 in Bora Bora. ("Va'a" is the term for Polynesian canoes.) This page offers streaming videos of the competition in various divisions (RealPlayer plug-in required).